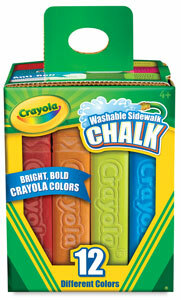 Add fun and color to outside spaces with Crayola Washable Sidewalk Chalk! These large, crayon-shaped chalk sticks are perfect for creating big art on sidewalks, driveways, and other surfaces. Their large size — 4-1/8" × 3/4" × 3/4" (10 cm × 2cm × 2cm) — makes them easier for young artists to hold and use, and an anti-roll design keeps them close at hand when you set them down. Crayola Washable Sidewalk Chalk washes away with water. Note: Set contents can be found in the Item Specs tab at the top of the page.